Have you been craving all the flavors of fall? This smoothie is the answer to your prayers if you can't stop thinking about pumpkin pie, but also want to have healthy digestion and a vibrant glow. Yep, you can have both. 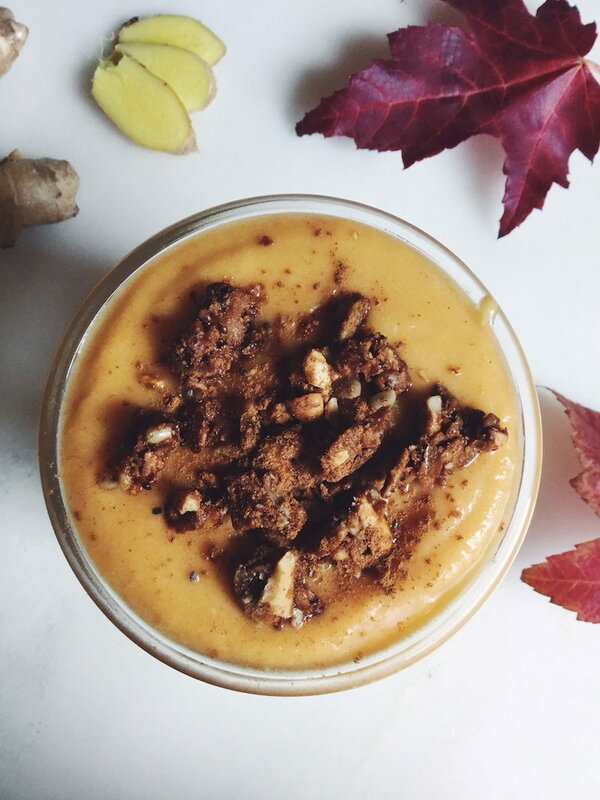 While this smoothie tastes a whole lot like pumpkin pie, it doesn't actually contain any pumpkin at all. The stand-in? Butternut squash. By first roasting (or baking) the squash, then freezing it, you have a base for a thick, creamy, naturally sweet pumpkin-y shake. 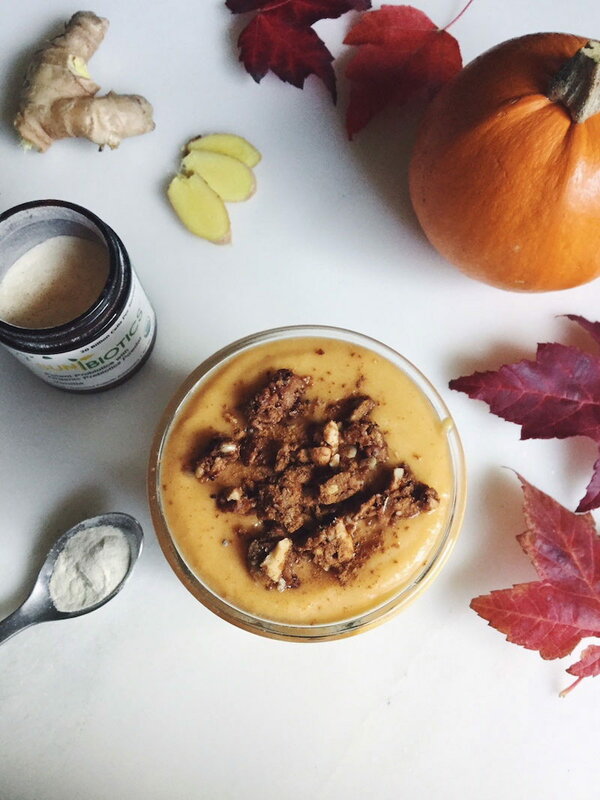 Toss it in a blender with a young Thai coconut, vanilla, and all the right pumpkin pie spices, and wham, you have a healthy plant based, vegan shake that tastes just as good as pie. 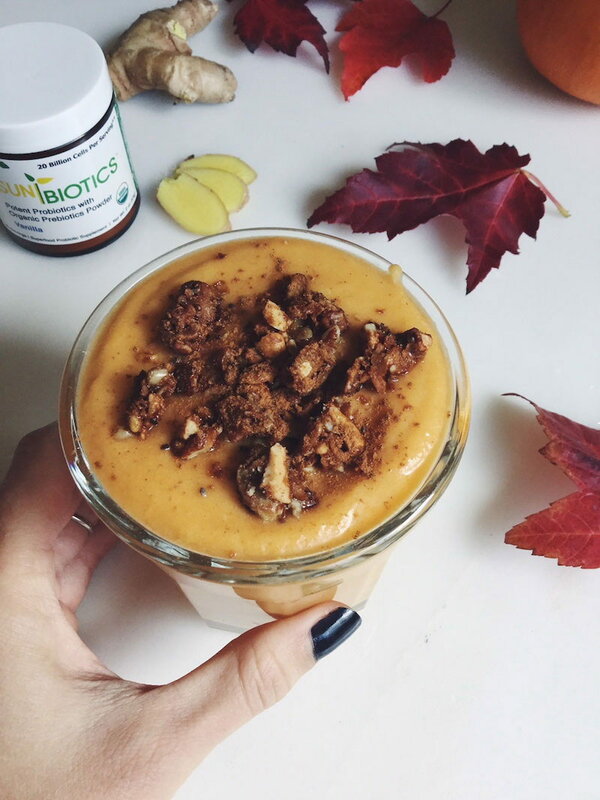 This recipe is naturally rich with soluble fiber to help cleanse the GI tract and promote smooth digestion, and will nourish your skin with a solid dose of antioxidants beta carotene (from the squash) and vitamin E (from rice bran solubles, also known as tocotrienols). A full dose of organic, dairy-free probiotics delivers 20 billion CFU's of gut-loving intestinal flora, as well as plant based prebiotics straight to your tummy for a solid boost to digestion and immunity. Pure, wholesome, plant-rich deliciousness. 1. First things first - the day before you'll want to bake or roast your butternut squash, then freeze it. Slice the peel away, cut your squash into cubes, coat lightly with coconut oil, and roast at 375 for 45 minutes or until well done. After it cools place in freezer bags in the freezer overnight. 2. Crack open (carefully) your young Thai coconut, removing the meat and water. You'll likely need all of the water from the coconut for this recipe and about 1/2 of the meat. Save any extra in the fridge for another smoothie. 3. Take your frozen butternut squash, coconut meat, minced ginger and coconut water, and blend until smooth, thick and creamy. Add remaining ingredients (vanilla, spices, probiotics, and additional sweetener if desired) and blend again briefly until completely smooth. Enjoy the tummy-loving goodness!